Nadia Myre, Slit, from the series Scarscapes 2, 2017. Courtesy of the artist and Art Mûr. 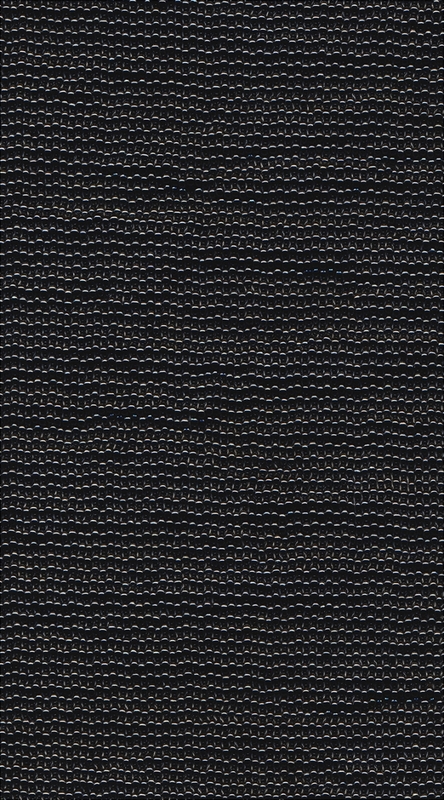 Nadia Myre, Black, from the series Scarscapes 2, 2017. Courtesy of the artist and Art Mûr. Nadia Myre, Circle, from the series Code Switching, 2017. Courtesy of the artist and Art Mûr. 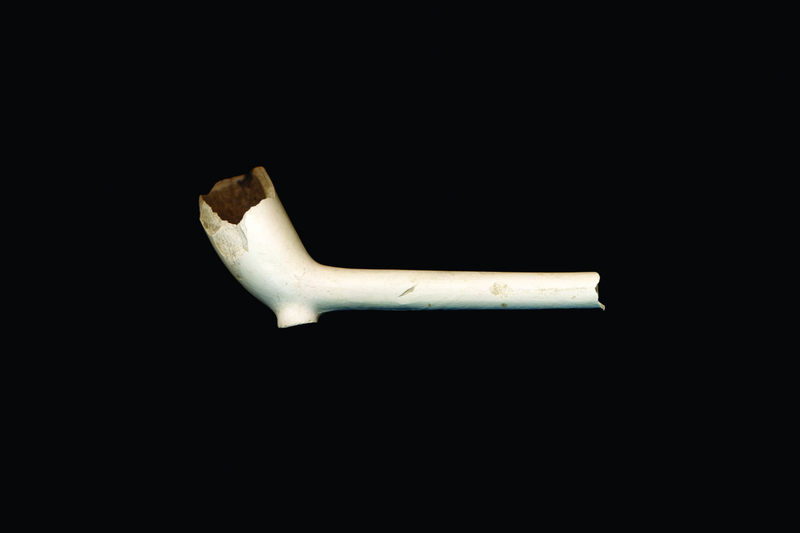 Nadia Myre, Pipe, 2017. From the series Code Switching. Courtesy of the artist and Art Mûr. Nadia Myre, Contact in Monochrome (detail; installation at Toile de Jouy), (detail; installation in Toile de Jouy), 2018. Digital wallpaper print Courtesy of the artist and Art Mûr. Photo: Ross Fraser Mclean. 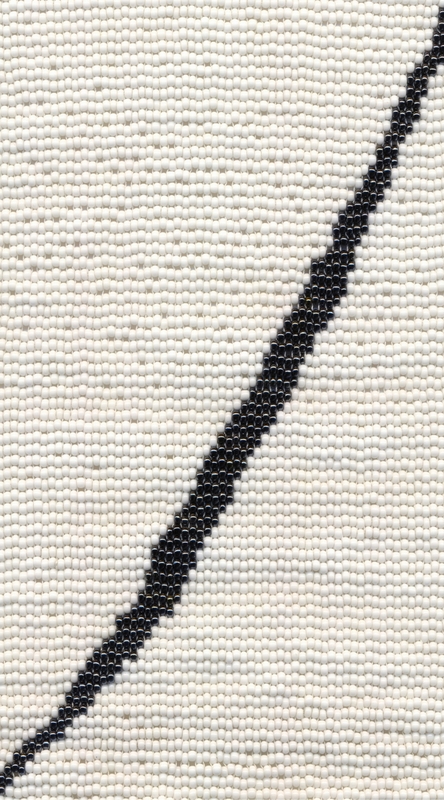 Nadia Myre, Pipe Beads, Courtesy of the artist and Art Mûr. Nadia Myre is a Montreal-based interdisciplinary artist of mixed Algonquin and French-Canadian heritage. A member of the Kitigan Zibi Anishnabeg First Nation, Myre draws attention to the power and histories of Indigenous textile practices, which she situates in a colonial context. Balancing Acts is a survey of the artist’s photography, beadwork, textiles, audio, video, and sculpture made over the last ten years—some on view for the first time. Myre’s hallmark multidisciplinary methodology honours many media that actively, yet subtly, converse with one another by engaging with the material and the non-material. Her digital print Meditation (Respite 01) (2017) pulls the viewer into a constellation of deep contemplative space derived from the image’s origins in the physicality and aesthetics of Myre’s own beadwork. I worked out your loss (2016) is an oversized photograph of a pair of awkwardly crafted babies’ moccasins and a crocheted basket of the artist’s making, conceptually scrutinized as forlorn artifacts with imprecise provenance; Myre’s process of making these traditional artifacts is documented in her multi-channel video Acts that Fade Away (2016). Myre’s deep respect for and commitment to the act of making things by hand is evident throughout this exhibition. Balancing ancestral and contemporary methods of working, her practice is informed by shared family, social, and community knowledge, while engaging present-day museum practices and academic research. 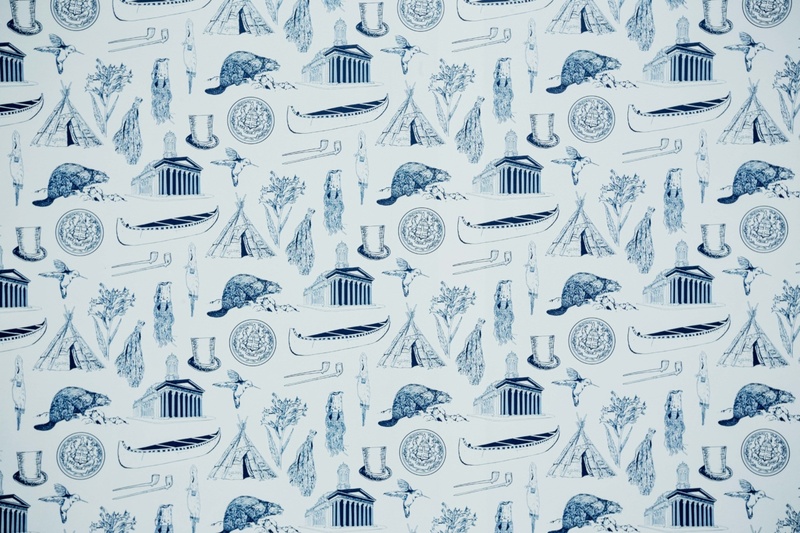 The wallpaper print Contact in Monochrome (Toile de Jouy) (2018) incorporates a jumble of all-too-familiar colonial and Indigenous motifs, each one more stereotyped than the next: hand-drawn images of 19th-century European beaver-pelt top hats, imposing colonial architecture, tobacco leaves, wigwams, and birchbark canoes all acknowledge recent intercultural histories. Myre has long been interested in destabilizing fixed readings of personal and cultural identity by switching scale, materiality, and context. The artist’s ongoing Code Switching project extends these methods to focus on shifting and shared Indigenous and European relationships. 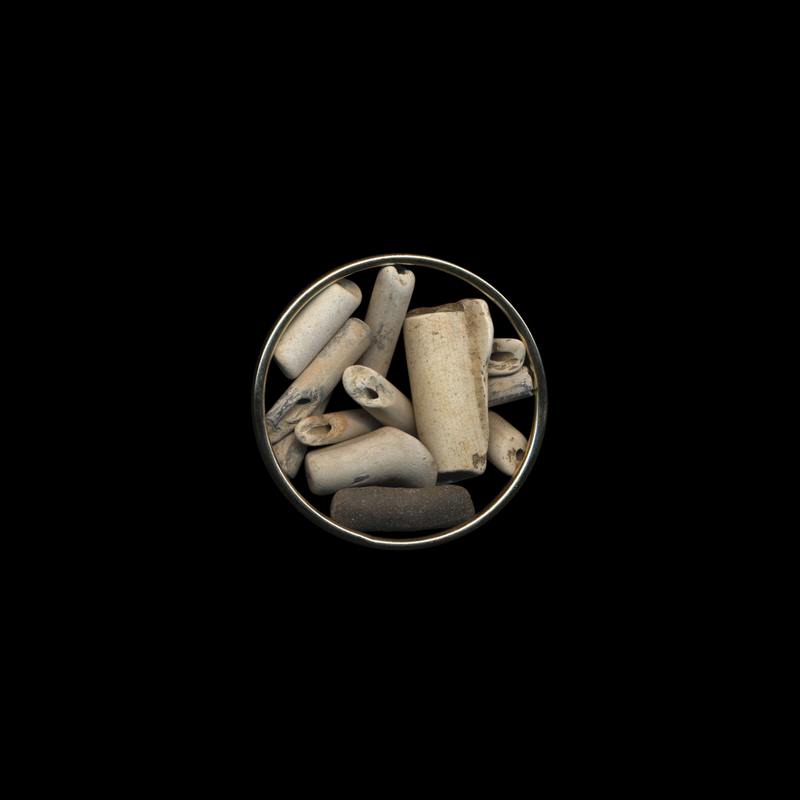 Since 2015, she has photographed, scanned, altered, and recreated fragments of clay pipes that she collected from the banks of the River Thames in London, England, where the pipes were manufactured for centuries. Their shapes are much like those made and used by Indigenous communities; both were used for the smoking of tobacco, a significant trade item, and a mutually enjoyed activity. Myre’s project of making new images and objects (tobacco baskets, sculptures, and photographs) from these commonly found colonial artifacts confounds institutionalized archaeological narratives of authenticity by creating a new version that considers productive cultural exchange. Other pieces in the exhibition speak to broader, pressing issues: a massive, red, netted-textile structure flags troubled relationships to our environment, and a selection of intricate black-and-white loom-woven beadwork from the series Scarscapes (2009) is a graphic interpretation of the sharper, darker edges of human scars and healing. All of these works emphasize the artist’s skilled, precise gestures, inviting viewers to pay close attention to small, oft-overlooked and undervalued markers of cultural production and loss. Myre explores the politics of belonging by positioning her practice through a poetic, feminist backdrop of craft, care, and resilience.